158 years ago today saw the publication of my hero Charles Darwin’s On the Origin of Species. Darwin was staying on the edge of Ilkley Moor at the time, just 13 miles as the curlew flies from where I type these words. 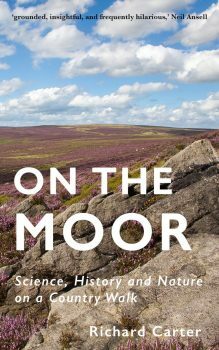 I’m delighted to announce that my book On the Moor: Science, History and Nature on a Country Walk is now available as both a paperback and Kindle ebook on Amazon.co.uk, Amazon.com, and other international Amazon websites. the best way to cook a wheatear. …Oh, and there’s even a plane crash! I appreciate I’m a bit biased, but I think you’ll like it. Richard Carter’s fascinating exploration of his local grouse-moor in West Yorkshire digs deep into natural history, human history, prehistory, and the history of science. His writing is grounded, insightful, and frequently hilarious, and he shows how falling in love with your own local patch can be a gateway to the whole world. Apologies for the shamelessly pluggy nature of this edition of the Rich Text newsletter, but it isn’t every day to get to announce your first proper book. Normal service will be resumed next time. …Are you still here? What are you waiting for? GO AND BUY MY BOOK, DAMMIT! ← Newsletter No. 9: Teaser or spoiler? My eighth annual video slideshow. In which I am interviewed for a ‘radio’ documentary. Where has all the heather gone? The Moor is looking decidedly lacklustre this August. On the advantages of being a crap gardener. Liverpool · chinese warriors · Ben Myers · shoes on wires · Patti Smith · Wuthering Heights · stratigraphy · astronomy · ancient DNA · storm petrels · LIMONCELLO ICE CREAM!! Letters to and from Darwin in the immediate aftermath of the publication of ‘On the Origin of Species’. A year in the life of a Scottish bookseller.